‘The report of my death was an exaggeration.’ That was Mark Twain speaking but it could have been Khalifa Haftar. One year after he was widely reported gravely ill or even dead, the Libyan general stands larger than life at the gates of Tripoli. From his stronghold in Benghazi far to the east, his self-styled Libyan National Army now controls almost all of the country – and this coalition of militias has entered the outskirts of the capital in the far west. Only a hastily convened band of probably equally miscellaneous militias has so far prevented him from toppling the UN and internationally recognised Government of National Accord (GNA) led by Fayez al-Sarraj. It seems that Haftar’s rapid advance from Benghazi over the past few days has welded these militias into a stronger force than many expected. At its core are the battle-hardened and well-armed Misrata and Zintani militias. Haftar’s rapid westward sweep has even more forcefully underscored the already apparent futility of the UN and African Union (AU) diplomatic efforts to resolve the crisis. AU Commission chairperson Moussa Faki Mahamat met Haftar in Benghazi just two days before he launched his attack. Haftar had ‘agreed to cooperate in the preparations of the African Union-led National Conference on Reconciliation to be held in Addis Ababa in July 2019’, Faki announced then. That conference is meant to support the UN conference, convened by UN special envoy Ghassan Salamé, which was scheduled to take place this weekend but has been postponed indefinitely. Haftar showed even greater contempt for the UN by launching his attack while UN Secretary-General António Guterres was in Tripoli to arrange the UN peace talks. What happens next is uncertain and precarious. Diplomats in UN and national capitals are frantically trying, in vain it seems, to persuade Haftar’s allies to urge him to call off his attack and return to the peace table. Silvia Colombo, head of the Mediterranean and Middle East Programme at the Italian Institute for International Affairs, fears that Haftar is more likely to want to go for broke and conquer Tripoli. She believes he has very little political constituency or skill and so will probably bet his future purely on military victory. So Haftar will probably raise the military stakes to do so. That is already happening with more artillery and airstrikes. These could plunge Libya into its third protracted civil war since the 2011 struggle that toppled Muammar Gaddafi – though Libya has really never been at peace since. Internally Haftar is backed by a band of diverse militias, some of whom Colombo thinks are held together more by the promise of spoils than any higher purpose. Internationally he has been getting various levels of backing from Egypt, Saudi Arabia and the United Arab Emirates in the Middle East, from France and Italy in Europe – and from Russia, Colombo says. She says Paris and Rome are ‘hiding’ their support by publicly calling for restraint and urging both sides to return to the peace table. But she believes the logistical and political support will continue. What motivates this external backing for Haftar is not completely clear. Colombo believes that Egyptian President Abdel Fattah el-Sisi is a natural ally for Haftar, as both are authoritarian military strongmen. Matt Herbert, consultant to the Pretoria-based Institute for Security Studies (ISS), adds that El-Sisi has looked to Haftar to bring order to eastern Libya in order to thwart terrorist groups who have used it as a rear base for attacks against Egypt. And the Middle Eastern backers as a whole are simply looking to increase their influence over the oil-rich country, Colombo believes. Backing Haftar is also an extension of their Middle East rivalry with Qatar and Turkey which are backing the GNA government in Tripoli, though far more tepidly. 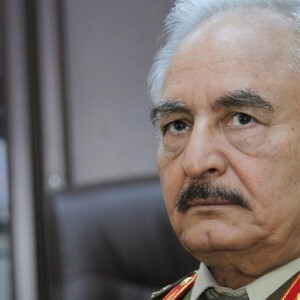 The three Middle East backers also like Haftar for his supposed animosity to Islamists in Libya – he claims his real targets are these ‘terrorists’ – which echoes theirs on their home turf. Yet Colombo says in reality there are Islamists on both sides of the Libyan conflict and that Haftar’s loose coalition includes some of the most extreme Salaafist militias in the country. Another theory is that the outside backers see Haftar, for all his faults, as forceful enough to end the interminable civil conflict, countless schisms and rival governments, and to unite the country at last. This reflects a kind of nostalgia for another strongman – like Gaddafi – to take charge and reimpose order on the lawless country, even if that order is likely to be harsh. Colombo dismisses these hopes, insisting that Haftar’s lack of political constituency or political skill would make it impossible for him to govern effectively if he does conquer Tripoli. Herbert adds that his age, 75, also counts against him, limiting his ability to rule long enough to have a significantly positive impact on the fractured country, should he gain power. So the road ahead looks rockier than ever. Political divisions internationally further complicate efforts to stop the fighting. Although the AU’s Peace and Security Council met this week to call for peaceful inclusive dialogue, it did not specifically demand that Haftar end his disruptive assault. Perhaps that’s because the AU is compromised by the awkward reality that its current chairperson is El-Sisi, possibly Haftar’s biggest international fan. The same applies at the UN. Last weekend Russia blocked the US from issuing a formal UN Security Council statement calling on Haftar to back off from Tripoli. Russia insisted the statement should condemn all military action or none. So the statement wasn’t issued. Ominously echoing the Syrian impasse, the threat of a Russian veto seems to be frustrating Security Council efforts to draft a resolution putting pressure on Haftar to retreat, as the UK is reported to be contemplating. Where would that leave South Africa, incidentally? Would it back Russia in its clash with the Western powers on the Security Council, as it usually does? That would put it in an awkward position. Libya figures prominently in Pretoria’s foreign policy discourse but that’s almost entirely in hindsight. In 2011 it joined the other two African nations on the UN Security Council – Nigeria and Gabon – in voting for Resolution 1973 authorising military action against Libya. South Africa then claimed it had been betrayed by the North Atlantic Treaty Organization (Nato) which helped bomb Gaddafi out of power instead of just protecting civilians. Nato, South Africa contends, thereby thwarted the AU’s peace efforts. If Pretoria now opposes tough action to prevent Haftar from sabotaging both the AU and the UN’s Libyan peace efforts, it could be accused of being more anti-Western than sincerely concerned about the welfare of the Libyan people. Now and perhaps retrospectively, back in 2011.